The image of this drop of water on a stem reminds me of a common metaphor used to describe the nature of the human-divine relationship. 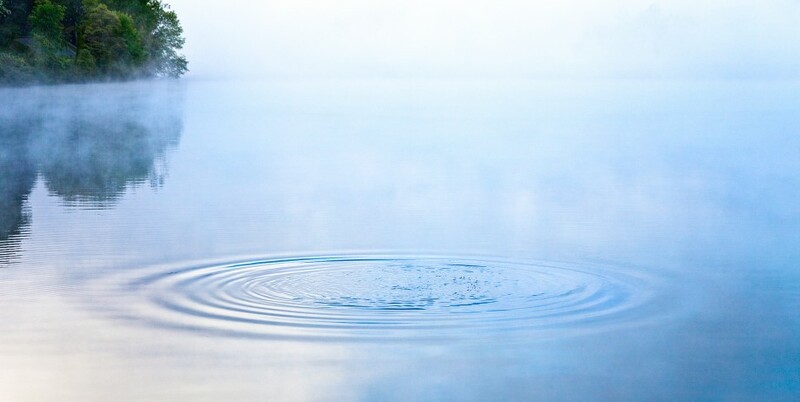 While each drop of water is singular, unique, separate and ever changing no matter its shape or location, in essence it is water. Human beings are like individual drops of water in the ocean of the divine. Considering the mass shootings that are occurring so often, one of the predominant patterns being reported indicates that the perpetrators were disenfranchised individuals, people who for various reasons “fell through the cracks” within their social systems—family, school, church, workplace or other. Even those involved in hate crimes or terrorist activities are often individuals who were abandoned, abused or otherwise marginalized in their youth. Whether an individual is mentally ill or has a troubled background, feelings of anger and resentment escalate when a person is disregarded or discarded. I’m not a psychologist, but common sense suggests that these individuals need the right kind of attention, whether it be love, support, encouragement, empowerment or regular medical care. When they don’t get it, when they feel disconnected and hopeless they may want to strike back. Linda tells about the nuns in high school who encouraged their students to never let anyone feel excluded. Her group in particular took it to heart by inviting a particularly shy and quiet girl to sit with them at lunch. Years later she sat with them at their fiftieth reunion. Another example of this was my mother who, on “Fun Night” at her retirement center always invited people on the sidelines to dance. Several of these widely diverse people—who said they didn’t dance, but did for her—became her best friends and helpmates. Of course there’s no way to know how those lives might have been otherwise, but engaging people who tend to be shy, alone or even preferring to be alone, whatever the reason, is something that everyday people in everyday situations can take notice of and make a difference in someone’s life. Anthropologist Ashley Montagu observed that “Persons… come into being only through social interactions. The interacting person finds the meaning of his life in his relations with other persons and their thoughts and activities.” Without interaction, an individual feels—is—adrift. Social psychologist Erich Fromm articulated the consequences of feeling alone, disrespected or ostracized. “Unless a person feels that he belongs somewhere, unless his life has some meaning and direction, he would feel like a particle of dust and be overcome by his individual insignificance. He would not be able to relate himself to any system which would give meaning and direction to his life, he would be filled with doubt and this doubt eventually would paralyze his ability to act—that is, to live.” The statistics on teen suicide are additional evidence of this, and a call for those who see something to say or do something. In this drop of water I also see an individual filled with potential. Although the details within it may be obscure, they can come into focus through engagement with other drops. Together, they can constitute an ocean. No man is an Island, entire of itself; every man is a piece of the Continent, a part of the main; if a Clod be washed away by he Sea, Europe is the less, as well as if a Promontory were, as well as if a Manor of thy friends or of thine own were; any man’s death diminishes me, because I am involved in Mankind; And therefore never send to know for whom the bell tolls; it tolls for thee. There’s a condition under which I can almost always make images that evoke a Wow! in me. It’s after a hard rain- or snowfall when the earth is still and the sun shines brightly. Conditions like that urge me to get out in the garden or walk the neighborhood with a camera, a closeup lens and a tripod—necessary to do fine compositional and depth-of-field adjustments to increase or decrease the sharpness of the background. I mention this because this happens occasionally—at home. This particular image however, was made at Longwood Garden in Kennett, Pennsylvania. I wandered their magnificent conservatory with a closeup lens and tripod, and came into a section where the plants had just been watered. By opening the camera’s aperture as wide as possible, the struts in the window behind the plant blurred out completely, but you can still see them in the drop. Notice also the slight blur in the vine due to movement caused by the air handling system. 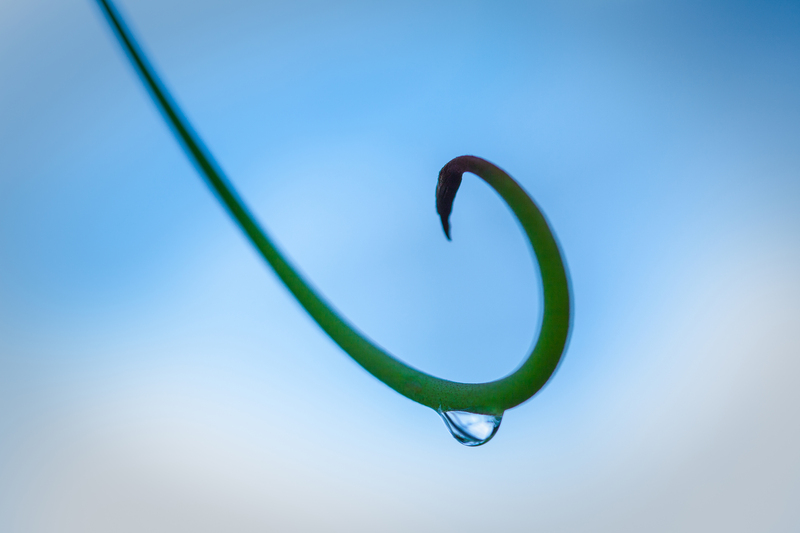 The sharpness of the drop could not have been made without the tripod. This entry was posted in Uncategorized and tagged Ashley Montagu, disenfranchised, divine, drop, Erich Fromm, individuality, Longwood Garden, marginalized, mass shootings, person, rain, Sisters of Notre Dame, water. Bookmark the permalink.